Please join us this Sunday, September 13 for our weekly Service Reading entitled “Man’s Highest Conception of God”. The service is from 11 am to 12 noon. Sunday School for children ages 3-12 is also held from 11 am to 12 noon. Parents with younger children may enjoy the service from the infant room located in the Sunday School building. The Reading Service is preceded by a meditation service from 10 to 10:45 am, and by group practice of the Self-Realization Fellowship Energization Exercises at 9:40 am. The Center is open to the public for services and special activities. • Our next Day of Service and Fellowship will be held this Saturday, September 12. If you are planning to attend, please let Sudha know by emailing him at vasudhaven@yahoo.com as this will help us to organize head count for the Day of Service. • Please note that the Bhagavad Gita Study Group meeting for September has been cancelled. • Our monthly meditation retreat is scheduled for next Saturday, September 19 from 9:00 am to 4:00 pm. This month we will have a guided meditation in the morning, which will include group practice of the SRF techniques of meditation. All are welcome to attend at any time during the day, but we ask that you enter or exit the chapel only during chants or readings. The SRF Energization Exercises will be conducted as a group at 9:00 am. • The birth and mahasamadhi of our SRF line of gurus are very sacred occasions and are celebrated with special commemorative services at our Chapel. These commemorative services are especially important for all devotees, as the blessings of the masters are especially strong during these days. Therefore, we encourage and urge everyone to attend. Our next commemorative service is the Mahasamadhi of Lahiri Mahasaya, which will be held on Saturday, September 26. Please mark your calendar. An information sheet on commemorative services is available in our chapel foyer and can also be viewed by clicking on this link. 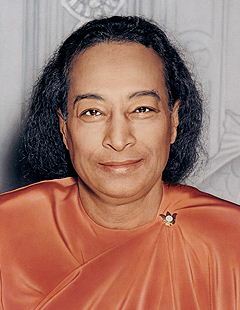 • A special screening of the movie AWAKE: The Life of Yogananda will be held on Saturday, October 3 at the India House at 8888 W Bellfort Ave in Houston from 7:00 pm - 8:30 pm. Please refer to the flier posted in the Sunday School building for more information about the event. If you are interested in volunteering at the event, a meeting will be held next Sunday, September 20 after service in the Sunday School building. • Please join us this and every Sunday after the services for our weekly juice social in the Sunday School building.